Once again I have a half remembered show that is bugging me. The show was a mystery of the week kind of show sort of like X-files but with a more comedic tone. The show also featured a computer that was powered by the Rosetta stone, and a comic relief character who happened to be a pig human hybrid. I watched it sometime between 2000 and 2005 in South Africa, but the show was clearly American. 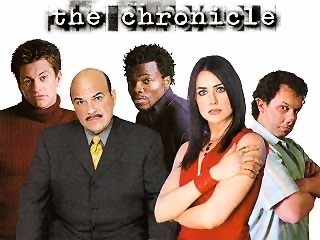 Could be The Chronicle which aired in the US 2001-2. It has a character named Sal the Pig-Boy. You can see him & the rest of the cast in the pictures. Need help remembering a Space movie!